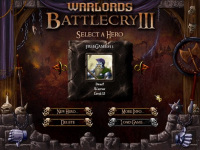 Warlords Battlecry III is a real time strategy game where you will collect resources and then prepare the war troops to defeat all other races inside the map. Collecting the resources is done by converting existing mines to be yours. If the resources are sufficient, you can create buildings that are beneficial to create more troops and weapons and increase their strength. This game uses common RTS game controls such as drag/click to select units, and right-click to move the troops or attack enemies. Press ALT+S to save the game in progress. It is also possible to create shortcuts to a unit or a number of units by pressing CTRL+Number. Select them back by pressing the Number. If you are new to RTS game, it's highly recommended to play the tutorial first. Please see the list of controls by opening the 'Readme' file from: Start Menu - Programs - Enlight - Warlords Battlecry III Demo. If the game does not show up after launched, please try this solution. Feel the atmosphere of total soccer experience in clean 3D graphics environment.